A headlamp is a light fixed on to a headband kind of object and is meant to provide illumination in front of the person wearing it in case of low light conditions. It can be said to be an advanced form of a torch where you can keep your hands free for other activities in the dark. The headlamp can be turned on and the modes of lighting can be changed from high to low using just a push of a switch. Such wonderful uses have made them extremely popular among travellers, hunters, hikers, rock climbers and backpackers. This Guide on some of the Best Hunting Headlamps will surely help you for your next adventure. If you are out for some nighttime hunting or hiking, it is considered that you should carry along a headlamp with you for safety as well as convenience. You can use the bright lamp right on your head to have a clear vision of the path in front of you while in the dark. Nowadays there are hundreds of headlamps available all over the market. To have the best experience during nighttime adventurous activities, having only the best headlamp is useful and essential. Read on to find out how you can pick up the best products easily on your own. Hikers often face a dilemma regarding the model of headlamps they should choose. Since the market is flooded with competitors, it is necessary for the buyers of hunting headlamps to know about the ideal features of a headlamp. They should be aware about the qualities that a hunting headlamp must have in order to make the best choice on their own. The quality of a headlamp depends on several factors. Here are some of the features that you must inspect and compare before buying a headlamp for your needs. This is the amount of light energy that is let out by the headlamp. This is important in determining the brightness and the beam distance of your headlamp. It is ideal to go for headlamps with the power of at least 100 lumens. The higher is the amount of lumens emitted by the headlamp the better is the brightness and beam distance. An ideal hunting headlamp should have ample brightness and a wide and long beam distance. The beam distance signifies the farthest point which is illuminated by the headlamp. The longer is the distance, the greater is the area illuminated by your headlamp. Therefore, whenever you are buying a headlamp make sure that it has a long and wide beam distance and is bright enough to give you clear vision in the dark. Whenever you are out for hiking or hunting, it is not possible to change the batteries or recharge them every time they run out. A headlamp would be of no use at all if the batteries run out fast. An ideal headlamp should have batteries that can at least run for at least 6 hours or more without being recharged. 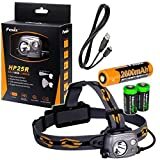 Moreover, it is even better if the headlamp can run on rechargeable batteries as well as standard batteries because charging is problematic during long treks and hikes. Always check the battery life and read reviews of the headlamp before buying it. If the battery life isn’t great, there is no point in buying a headlamp for long treks and hunting trips. hunting or hiking isn’t always done on smooth roads or perfect weather. It often goes on for days when the weather may be rough. An ideal headlamp should be able to withstand dust or heavy rains too without getting affected. The design of the headlamp should be made waterproof so that it is resistant to even heavy showers for long hours. It is very important to check this point while you are buying a headlamp for your expeditions. since you are going to wear the headlamp on your head and need to move about quite a distance, these should be as light as possible. It is difficult and inconvenient to move about freely or feel comfortable when you have a large, bulky or heavy burden on your head, even though it is helping you. Therefore, always check the weight of the headlamp before buying it and try to keep it as light as possible to walk freely without any discomfort for long distances. When massive illumination is the topmost priority on your list then all you need is a Fenix HP25 headlamp. Very few can beat this one in being one of the brightest headlamps ever and it definitely helps a lot on your hunting trips. Even though this one does not score high on the battery life, it still is on the popular list because of its superb illumination. So in case you need a headlamp that beats all its competitors in the illumination category, this is the one you should select. It has a spotlight mode and a floodlight mode with a total output of 360 lumens. You can use these LEDs together or separately as per need. The LED spotlight can be used at turbo mode giving an output of 1000 lumens or 614 feet, 350 lumens on high mode, 130 lumens on mid and 30 lumens on low mode. In the spotlight mode, the batteries can work for 1.5 hours on turbo mode, 4.5 hours on high, 12 hours on mid and 42 hours on low. The LED floodlight can give an output of 350 lumens on high mode, 130 lumens on mid and 30 lumens on low mode and 4 lumens on eco mode. In the floodlight mode, the batteries can work for 2.5 hours on high, 12 hours on mid and 42 hours on low. A 60-degree tilt helps to adjust the beam of the headlamp as per need. The memory circuit remembers the previously used brightness level and works accordingly on its own. It has a red light for nighttime illumination. It is waterproof and therefore can be used in any weather condition. Being dustproof, it does not let particles and debris get underneath the surface. The aluminum body of the headlamps makes way for heat dissipation. It weighs 183.5 grams without the battery. The automatically regulated output maintains the consistency of the brightness. The headlamp is waterproof and dustproof, which are definitely plus points. It provides the brightest illumination when compared to others and is wonderful for clear vision. It comes with spotlight and floodlight options, which can be used together or separately. Battery level indicator keeps you alerted. The red light provided could have been a bit brighter than it is. 4 batteries make it quite heavy for use. When you need a headlamp that lives up to its claims and provides satisfactory results, you can definitely try out the Petzl Tikka RXP Headlamp. This is an advanced and powerful model and acts as great lighting equipment. It is of immense help in activities like trekking, hiking, mountaineering, hunting, backpacking, etc. This is not the cheapest of the lot but the price is absolutely worth the features of this marvelous product. It provides great illumination of 215 lumens. This makes it a powerful and reliable performer in all low light conditions. This is quite suited to help trekkers, hunters and mountaineers who need a reliable source of lighting for long hours. The headlamp has got an intelligent sensor that detects the natural light in the ambience and adjusts the brightness and the beam automatically on its own. This saves time and manual operation on your part. The headlamp comes with 3 modes, namely, the Max Power mode, the Standard mode, and lastly, the Max Autonomy mode. The Max Power mode makes the highest use of the battery and makes it last for about 3.5 hours. The Standard Mode drains the battery slower than the former and can make it last for 6 hours. The last mode called the Max Autonomy mode makes the most economic use of the batteries and they can last for 12 hours. The beam pattern of the headlamp can be adjusted to get the best results every time. The headlamp has a special lock feature, which prevents accidental turning on of the headlamp in the backpack while on the move. It has a red light feature, which makes it suitable to be used as a night vision device. It has also got a battery level indicator to keep you on alert while you are using it. The headlamp is perfect in terms of weight, which makes it convenient for the people using it. This is quite hardy and durable and lasts for years. The illumination provided by the headlamp is huge and provides clear vision over a large area. The sensor detects the lighting conditions automatically and adjusts itself. The battery life of the lamp is quite short. It may cost you a bit but if you are ready to pay the extra amount you are definitely not making a wrong choice. 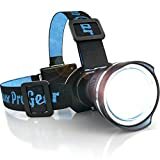 If you are on the lookout for a perfect headlamp that would be your constant companion for all outdoor activities like hunting, camping, hiking, backpacking, running and biking, this Outdoor Pro Gear LHB-1000 Lumen LED headlamp is just what you need. It cannot only help in recreational but also professional activities and indoor needs too. It provides the best kind of illumination and you are definitely going to be surprised by its superb performance. There are a lot of things on offer and this is definitely worth the price you pay for it. At 1000 lumens, it provides the brightest illumination all around. The body of the headlamp is made from aero aluminum, which makes it hardy and resistant to weather conditions. Therefore, it can be used in any adverse weather conditions without getting damaged. Convex lens focus technology creates huge lighting that can aid in all outdoor activities even when it is dark. Even light distribution gives better and clearer vision whenever and in whichever condition you use it. The design of the headlamp is small and compact and does not occupy much space in your gear when you are out for camping, hunting or hiking. The best feature is that the beam of the headlamp is adjustable according to your need. It can be changed from being a narrow focus spotlight to a wide floodlight. Change the modes according to the purpose you are using it for. There are three modes of illumination, namely, High mode, Low mode and Strobe mode. In the High mode the longest battery life is 22 hours and in the Low mode it can run for 30 hours. This saves you the trouble of having to recharge the batteries every now and then. You can safely use the headlamp for long hours in areas where electricity is scarce. Even though the body is sturdy, it is light enough to sit comfortably on your head and won’t slip off or seem like a burden. The battery life is great and this is definitely one of the points that attract customers. It can go on and on even on high mode without having to recharge frequently. The illumination is one of its biggest qualities as it provides very bright lighting outdoors even when it is dark. It is of great use for several indoor and outdoor activities. The price seems really affordable and given this superb performance, this is surely a lucrative offer. The lighting modes and the adjustable beam is of great convenience to the customers. Nothing much that bothers customers. 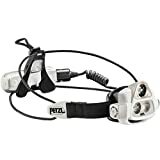 Another popular headlamp that provides brilliant illumination for all kinds of outdoor activities is the Petzl Nao Headlamp. Headlamps from Petzl are usually quite impressive and popular among the customers because of the performance. This headlamp providing illumination of 575 lumens is a great choice for biking, cycling, hiking, camping, and such other outdoor recreational activities. Performance wise, this meets the standards of professionals and experienced hikers and mountaineers. Overall, this is worth the money you pay for it. Advanced technology provides the best kind of illumination to the people using it. The headlamp can emit 575 lumens and provides immense lighting even in the dark. The beam length and strength is definitely praiseworthy and meets professional standards. Reactive lighting technology helps to adjust the brightness and the pattern of the beam automatically. This kind of intelligent technology understands the natural lighting of the ambience and adjusts the brightness according to it. This saves you the trouble of having to manually adjust it every time. The headlamp runs on a rechargeable lithium ion battery but can also run using two standard alkaline AAA batteries in times when it is not possible to recharge. Therefore, you can carry replaceable batteries on long hikes and use your headlamp even when electricity is not available. In reactive lighting mode, the battery life is about 52 hours and this makes this headlamp a really powerful one. In case of constant lighting, it can run strong for about 8 hours. The battery compartment of the headlamp is detachable. It is fixed on the backside of the headlamp and maintains the balance but it can also be detached and fixed onto the belt to reduce extra weight on the head. The headlamp provides brilliant illumination and is suitable for all standard outdoor recreational activities like hunting or hiking. The design of the headlamp is impressive. The top strap can be used to attach the headlamp on to the head and secure it for long hours. The battery component can be detached and fixed anywhere else to make the weight lighter. The battery life is quite good and saves the trouble of frequent recharging. The headlamp can also run on standard AAA batteries. Reactive lighting technology is another plus point and the headlamp automatically adjusts the lighting according to the natural light. This makes it quiet convenient. The only downside of this immensely helpful headlamp is its price. The price is quite high and may not be affordable for all. But if budget is not that of a problem, this one is surely the one you can go for. If you have on your mind a simple rechargeable headlamp with quality performance and great battery life that is well within your budget, then this is it. The Black Diamond ReVolt is quite popular because of being a combination of the positive factors more or less. This headlamp scores lower in performance when compared to Petzl Tikka RXP but is also less expensive. If you need a budget friendly headlamp that provides satisfactory results without disappointing too much, this can be a good choice. This headlamp has one TriplePower LED along with two white LEDs and two red LEDs of SinglePower each. On a whole, the headlamp can emit up to 130 lumens at the maximum setting. It can run on three NiMH batteries, which are easily rechargeable. At the same time, it can also run on 3 AAA standard alkaline batteries too. This saves you the trouble on long hiking trips where electricity is a problem. In such cases, you can simply replace the battery and use the headlamp. The three-level battery indicator shows the remaining battery life to keep you on alert always. There are 6 different modes to choose from according to your needs. Switch on and off between Proximity, Distance, Strobe, Dimming, Lock and Red modes depending on the situation. The Red mode is appropriate for secret use in the dark and is thus beneficial to the military and also for hunters. The design of the headlamp is also dust and water resistant which makes it easy to use it in all weather conditions without worrying about damaging it. The performance offered is quite satisfactory considering the low price. The headlamp has 6 different modes of lighting to choose from. It runs for long without needing to recharge frequently. It also runs on standard AAA batteries, which can be replaced in case of an emergency. It is water resistant and therefore can be used in rainy weather too. The design of the headlamp is quiet lightweight and therefore comfortable for long hikes. The price is definitely attractive given the satisfactory performance. It provides adequate illumination for recreational activities. The illumination is not as great as the other models in the market. But if you are paying a lesser price you must make this much of a sacrifice. Petzl Tikkina is the best headlamp that you can get if budget is playing a problem in your interests. This is the best and the smallest headlamp at the most affordable price and customers have praised how they have benefitted from its excellent performance given the price tag. With this attractive price, good lighting and long battery life, this Petzl Tikkina Headlamp is definitely one to look for if you want a budget friendly option. The new Petzl Tikkina headlamp model is an updated version of the previous ones and this one has got a brighter performance. This model has a lesser output of lumens over the battery life. This keeps the batteries long running. This one has got a sleek design and a washable headband. The headlamp has got two modes of use. One mode uses just 20 lumens for long hours while the other mode uses up 80 lumens but stays for shorter hours. It may not be able to provide as much illumination as the other competitors and the measured beam distance is 31 meters. This is the best you can get at this price. The price at which you are getting it is definitely an attractive deal. The headlamp is quite light in weight and you can use it for long hours without feeling anything. This has got excellent battery life and goes on and on for a long time. It provides good illumination but it is not as bright as the others in the market. It might not be suitable for long hours of hunting or trekking. This can be good for occasional use and shorter durations. 1. How Do I Care for my hunting Headlamp? • Secure an O- ring on the headlamp to prevent dust and debris from settling into it. • Clean your headlamp occasionally to keep it in perfect condition. Do not rub it hard with tissues or newspapers or any harsh material. • Use a soft cloth to gently wipe the glass and preferably you should use special water or alcohol based solution designed to clean objects like headlamps for the task. • Keep it away safely in a case when it is not in use. 2. How should I use my Hunting Headlamps to its extreme capacity? • Know about the specifications of your headlamp to use it to its extreme capacity. Usually, the headlamps can be used in the low mode and high mode according to need. • Each headlamp has its own features and depending upon the power, a headlamp provides illumination over a certain area at its highest capacity. • The more powerful it is, the more is the area covered under its illumination. To make use of a headlamp to its greatest capacity, switch on the high power mode. 3. Where should I use my Hunting Headlamp? • Since the hunting headlamps provide illumination in areas around you, they can be used for various purposes. As the name suggests, you can take these to your hunting expeditions and have a clearer and better view of your surroundings even if the natural source of light is dim. Other than that, these headlamps can be of great use to travelers who indulge in trekking, hiking, rock climbing and mountaineering. • These are also of great use in running and to the military. Use them for each and every purpose to have the best lighting around you.